Eatalia’s has been a family run business dating back since 1981. Alberto and Dina, former owners of Vittoria restaurant at the time broadened their horizon in leith and opened the takeaway next door serving fresh fish and chips. Alberto would spend his mornings in Eatalias peeling and chopping sacks of potatoes by hand before returning to the restaurant next door to open up. Alberto and Dina’s hard work ensured that they could provide the lovely leithers with consistantly high quality fish and chips for many years to come. Today their daughter Ida and son in law Roberto are at the helm running things from top to bottom ensuring high quality of food and service are maintained. Previously called the Brunswick fry in 1996 they decided to change the name to Eatalia’s. In that time many changes have been made such as the improved menu with greater variety of stone baked pizzas, freshly cooked pastas, grilled burgers to add onto the wonderful fish and chips. You can now also have your food delivered by ordering online, goodbye to the days of wrapping in real newspapers! 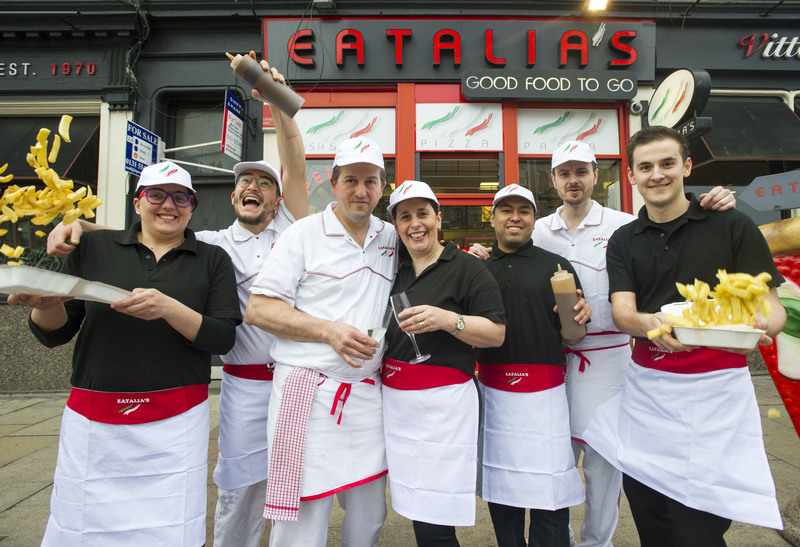 Eatalias has also had its moment of fame when it made an appearance on television in 2008, on a BBC “Take On The Takeaway” programme against Italian chef Antonio Carluccio OBE. Eatalias were chosen to compete against the famous chef in a battle of pasta and bruschetta, when Mr Carluccio narrowly won as outright winner. Many changes have happened over the years but one will always remain the same, serving high quality food.